A delicious side to serve with meat, or as a main luncheon dish with salad. Honestly I could almost eat a whole plateful of this! It is so simple but so tasty. First run-through I followed the recipe exactly from Homestyle Amish Kitchen Cookbook by Harvest House Publishers 2010. Having made it several times since I made only minor revisions. In a 4-1/2 quart stewpot or Dutch oven, brown the bacon until crisp and pour off grease. Set bacon aside to drain. Add the beans, potatoes, onions, salt, pepper and 3/4 cup of the broth to pan; stir. Bring to a boil, reduce heat and cover; simmer 15-18 minutes or until vegetables are tender-crisp, using the remaining 1/4 cup chicken broth if needed. Crumble or tear bacon and toss lightly into vegetables. 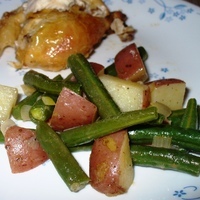 NOTE: Depending on thickness and freshness of green beans, you might want to give the green beans a 3 minute head start in simmering before adding potatoes so they will be done about the same time. I have just made your recipe and it is very lovely! I used my left over roast chicken juices and fats which added so much flavour that a chicken stock or soup was really not necessary at all. Thank you for this recipe. I will be adding it to my list of faves! Thanks for your review, and great flavor suggestion. Awesome veggie recipe. A good side. What a beautiful medley of vegetables.